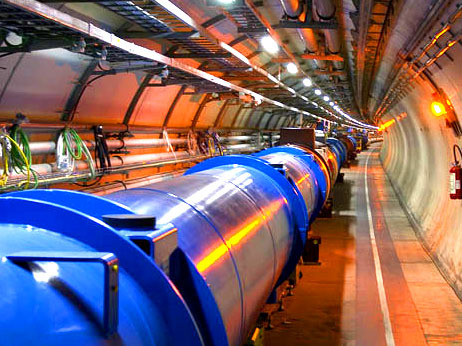 LHC may make time travel possible … to particles at least | UNBELIEVABLE! It can accelerate particles to within a fraction of the speed of light. It can re-create the conditions of the Universe when it was less than one second old. It aims to find the Higgs boson and produce a grand unification theory, thereby changing Physics forever. Now, the latest theory is that it will make time travel possible. Is there anything The Large Hadron Collider can’t do? It should be noted that this theoretical “time travel” will occur only on the microscopic scale, so the LHC won’t become a magic tunnel where people can dive in head-first and visit the Stone Age or the year 3000. However, it will produce particles that can hop between the past and future: some scientists believe that if the LHC can produce the Higgs boson, it will create another theoretical particle called the Higgs singlet, which can jump into an extra fifth dimension, thus being able to move forward or backward in time. The scientists proposing this theory admit it is “a long shot”. However, the theory is kept alive as “it doesn’t violate any laws of physics or experimental constraints.” And it remains an exciting theory, as information and messages could be sent to the past or the future if production of Higgs singlets could be controlled. Posted on March 16, 2011, in Chemistry, Physics and tagged Higgs boson, Higgs singlet, LHC, Physics, Time travel. Bookmark the permalink. Leave a comment.